Last summer I sat down in my backyard one evening to reflect on my life. For reasons that I can't really remember right now, I was feeling unhappy about living in Worcester, and wondering whether I should go on the job market and find my family a new place to live. Before I began to reflect on the topic, I did something I haven't done in a long time. I asked God to send me a sign. I wanted some sort of divine finger pointing me to the direction I should take: stay or go? I closed my eyes and meditated for a while, until I heard a rustling noise right near the bench I was sitting on. 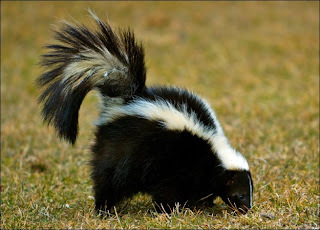 I opened my eyes and saw that a skunk was about three feet away from me, snuffling his snout through the grass and looking for grubs. I had competing impulses to jump up and run away and to continue sitting quietly and hope for the best. Since he was already so close to me without having taking any notice, I figured it best to sit tight and let him proceed on his way. Which he did, walking directly under the bench I was sitting on and meandering his way across the yard and eventually back behind the garage. I felt a small thrill to have experienced such closeness to a wild animal in my own backyard, even if it was a pretty common and urban wild animal. But immediately after he left, it occurred to me that such an unusual experience had to be the sign I was waiting for from God. But what did it mean? I decided quickly that it meant I should stay. God sent me that strange encounter to remind me that wonderful and unusual encounters were available to me right here where I lived; I didn't need to go searching for excitement in my life elsewhere, when I could find it right here in my own backyard. The thrill I felt in my encounter with the wild was open to me always, if only I was willing to open my eyes and experience it. Several weeks later, though, still feeling some dissatisfaction with Worcester, I realized that I had obviously misinterpreted the sign. While it may have been a wild animal, it was a particular wild animal: a skunk. God, with an impressive sense of humor, had sent me a very obvious message: Worcester stinks—get out as soon as possible. It has been almost a year now since I met that brave little skunk, and I have no idea anymore what its appearance might have meant. I still can't shake the feeling that it meant something, though—nothing like it has happened to me before or since, and the fact that I asked for a sign just before he came to visit me gives me this inescapable feeling that he was sent for me. I just can't seem to settle on a definitive interpretation of the meaning of that skunk. Which brings me to Harold Camping, whose prediction that the Rapture would occur on May 21st proved so spectacularly wrong, and who has responded to his error by acknowledging that he was wrong—and posing a definitive new date for the Rapture, on October 21st. While I don't much believe that anything like a Rapture will take place whenever our time here in this universe has run its course, I don't have any problem with people like Harold Camping believing in such things, as long as it doesn't interfere with charitable and loving practice towards your fellow human beings. And I don't really even have a problem with people speculating about when the end of the world will take place—although, as many commentators on Camping have pointed out, Christ specifically says that nobody, except for God in heaven, knows when the end of the world will take place. What strikes me as the real problem with Harold Camping, and the legions of others down through history who have made such predictions, is their certainty. There I think they go terribly wrong. Most of the great ills in the world, it seems to me, are caused by people who have absolutely no doubts in the truth of their convictions. When you are fully convinced that you are right, it gives you the latitude to dismiss the views of others, to justify bad behavior on your part, and to browbeat everyone around you with your convictions. It impels you to make predictions about the end of the world and pronounce them on your radio show, inspiring millions of people to fear and hope that they will be in heaven at the end of some specific day. It leaves a lot of sad and disillusioned people, still standing here on earth, at the end of that day. None of this means that people shouldn't have strong convictions—they should. But my strongest conviction is that you should always allow for the possibility that you are wrong. Maybe if you have a really strong conviction, you're ninety-percent convinced. But holding out that ten percent might make all the difference in the world in how you behave towards people who don't agree with you. My experience with my smelly little friend served as a great reminder of all this for me. Whatever I believe he might have meant, or not meant, I should always hold out the possibility that my interpretation might be wrong. And so, of course, should Harold Camping and all his followers. Maybe that's what the skunk was sent to teach me, after all. In my last post I was inspired by a recently published book to offer some reflections on heaven; in this post, I will return to a much older book to offer some reflections on hell. Somehow that seems appropriate. Earlier this year, I struck up a correspondence with another academic whose work I admire. When our e-mail conversation turned to the subject of religion, he seemed very surprised to learn that I was a Catholic. A lifelong agnostic, he described himself as open to the possibility that God might exist, but he was quite skeptical, even dismissive, of just about every specific religious belief, doctrine, or practice that we discussed. One sticking point that he kept returning to was the idea of hell. He kept nudging me on this point, reminding me that Catholics believe in hell. How on earth could you subscribe to a faith, he seemed to imply, that propagated such a ridiculous and manifestly unjust notion? I did my best to explain to him that my recent year of spiritual exploration had convinced me that worrying about the afterlife was about as useless of a preoccupation as I could possibly imagine, even—and perhaps especially—for the religious. Every deeply religious person that I have encountered and admired over the course of my explorations has been someone who focused their religious and spiritual practices on this world. Whether those spiritual practices drove them towards works of personal charity or political service, or gave them a sense of inner peace and contentment, these people exemplified for me the notion that spirituality should make a difference first and foremost in our lives here on earth. And even if that were not the case, I added, to my skeptical correspondent, we could spend every minute of our lives in speculation about the existence and nature of heaven and hell and we'll never get any closer to knowing whether or not we're right. Still, though, I did share with him the fact that the idea of hell was the source of my first disagreement with the religion of my childhood. At some point in high school I told my father that I found it hard to believe in a God who would create or allow the existence of hell. Always an open-minded and thoughtful person, my father invited a priest friend over for dinner, and encouraged me to share my disagreements with him. I don't remember whether or not that conversation resolved my immediate doubts, but I do know it began a lifelong process of bouncing back and forth between faith and unbelief, and of embracing and rejecting religious faith at different points along the way. My recent travels in the spiritual world have brought me back to faith, but of course who knows what the future will bring? Which brings me back to hell. A couple of weeks ago I was scanning my bookshelves for something to read, and my eye lit upon a very small, beat-up paperback called The Great Divorce, by C.S. Lewis. I have no recollection of either obtaining or reading this book. We had a bookstore in South Bend, IN, where I attended college, that featured extensive collections of books of philosophy and theology, and I'm guessing I probably picked it up there—but then stuck it on a shelf and never read it. I pulled it down from my shelf and read through it in an afternoon. An imaginative work of theological fantasy, the book offers a fascinating view of hell—not a place of fire and torture, but a graying town full of normal people—and an equally fascinating view of the relationship between heaven and hell. In Lewis's afterlife, a bus leaves from hell every so often and takes any interested residents of hell to the edge of heaven. There, inhabitants of heaven meet the bus travelers at the border and try to encourage hell's inhabitants to come join them in paradise. The residents of hell are free to enter heaven on the one condition that they have to leave behind the things that are keeping them from opening up to God's love—which of course happen to be the things they cherished the most in their earthly lives. Most of them refuse to leave those things behind, and eventually get on the bus back to hell. The kinds of characters who refuse to enter heaven make for instructive reading: sensualists who refuse to give up the pleasures of the body; a theologian who prefers arguing about God to believing in God; an artist who will not enter paradise if it means no more painting; a writer who refuses to give up the small literary reputation he has earned in hell; a showily pious man who refuses to enter heaven when he sees someone there who was a great sinner on earth; a woman who will not enter unless she can be guaranteed in advance a reunion with her dead son. The common feature of all of these individuals is that they place their own needs and desires first: they will only accept heaven if heaven will conform to their view of what it should be like. In some cases, they will only accept heaven if they get to choose who gets in and who doesn't. Almost all of them ultimately decide that they matter more than God, and that therefore they would prefer to return to hell, where they can endlessly—and unhappily—indulge their selfish needs and desires. Lewis's narrator, confused at the prospect that souls can leave hell anytime they want to, finally asks one of the heavenly host directly about the connection between heaven and hell. Can people really leave hell? “If they leave that grey town behind,” his interlocutor replies, “it will not have been Hell. To any that leaves it, it is Purgatory.” For the people that choose to stay, by contrast, it remains hell. The narrator, later on, offers the objection—voiced by many thinking Christians throughout history, including my own teenaged self—that it seems cruel that people can be in bliss in paradise while even a single soul suffers in hell. But this objection holds no water in Lewis's imagined afterlife. All who stay outside the gates of heaven do so by choice. “No soul,” the narrator's guide explains, “that seriously and constantly desires joy will ever miss it.” Should the choice of hell's inhabitants to reject God, the guide asks, prevent the rest of us from celebrating our choice to embrace Him? 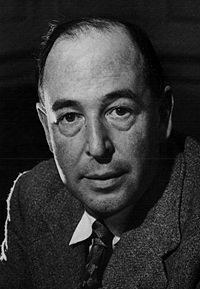 Although I find Lewis's theology occasionally frustrating—I see much to disagree with in his views of women and sexuality, as I do in the views of the Catholic church—he remains one of the most imaginative and charitable writers I have ever encountered on the notion that God should be defined as the source of inifinite love and mercy—and on the implications of that definition for the afterlife.